With Tim Duncan retiring from the NBA, it’s only natural our attention start shifting to San Antonio Spurs head coach Gregg Popovich. Sure, Manu Ginobili probably won’t play beyond next season. But Popovich and Duncan were synonymous with one another. It’s tough, in turn, to imagine one without the other. Maybe Pop will soon follow Duncan’s lead, riding off into the sunset, pretty much without warning. Oh, wait, that’s right. He can’t. o sign a few years back and he was like, ‘Are you going to be here?’ Tony [Parker], then Kawhi [Leonard]. Then when we were recruiting LaMarcus [Aldridge], he was like, ‘Are you going to be here?’ it just goes on and on. So I guess I can never stop, I can never retire. Coach Pop isn’t joking here. The Spurs have been aggressive in free agency over the last few years, and that’s unlikely to change. They should be able to carve out max room again next summer, at which point you have to believe they’ll be in play Blake Griffin, Chris Paul or Russell Westbrook—all of whom will probably want Pop to ensure he will finish out the life of their contract in San Antonio. At some point, though, Pop will have to say no or admit that he’s not totally sure. He is 67. He cannot coach forever. But he does plan on succeeding Coach K as Team USA’s head honcho, so maybe he has another four years left in him. Four years, in fact, may be his minimum. 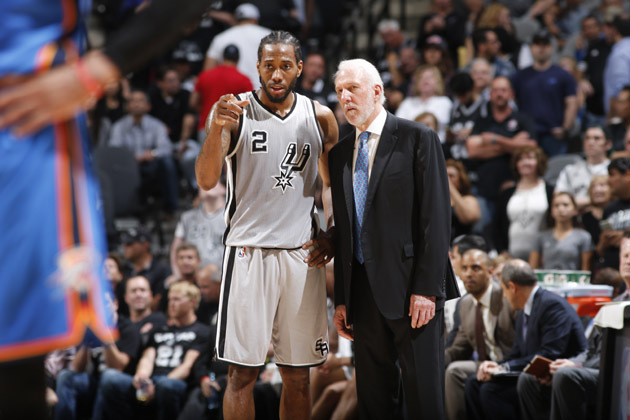 If Leonard indeed asked for a guarantee that Pop would be around for the life of his deal, that would put him in San Antonio through 2019-20—unless Leonard decides to opt out of his contract, which would culminate in retirement being fair game for Pop. Either way, enjoy Pop while you can. He won’t be around the NBA forever. He may, however, outlast his original Big Three at this rate.